As someone, who owns an automobile, you need to realize that you’ll be required to work on your vehicle at some point or another. In order to make that happen, you’ll need access to the appropriate tools. And of course, you’ll need to elevate your vehicle off of the ground. Therefore, you’re going to want to invest in a good hydraulic car jack. It is pertinent to use a jack that will be sturdy and safe. Anything less cannot be tolerated since an unsafe jack could put your life in jeopardy. Below, you will learn more about these products. When attempting to invest in a good jack, you will need to consider a wide assortment of factors. The price is definitely important, but you should not be afraid to spend more. A more expensive jack will provide you with more safety, while simultaneously giving you the ability to lift an additional weight. Other factors that should be examined will be provided below. One of the most important things to inspect is the jack’s weight capacity. How much weight can the jack lift? It is possible to find a 3-ton floor jack, but some are far more versatile. Some can support as much as 6, 12 and even 20 tons of weight. Make sure you choose a weight capacity depending on the specific object you’re interested in lifting off of the ground. Another thing to consider is portability. Some jacks are very heavy and this can make it difficult to carry them from one location to the next. However, some are actually equipped with wheels. If you want added convenience, you will be wise to choose a jack that can be rolled from one location to the next. Of course, the bottle jack will make a good alternative, since these models are lightweight and compact. A lot of jacks come with warranties. This is definitely a good thing. While the warranty may not improve the overall functionality of the jack itself, it could prove to be a lifesaver in the near future. With this in mind, you should always opt for the jack with the longest warranty humanely possible. Whether you are lifting a car, truck, or piece of heavy machinery, you are going to need a good quality jack that can hold the weight, while proving to be extremely reliable. That is exactly what the Strongway Hydraulic Bottle Jack can do, plus so much more. With its dual-stage hydraulic cylinder, this jack is capable of lifting larger loads with a smaller footprint. Along with its 6-ton capacity, there really isn’t much that this jack can’t do. 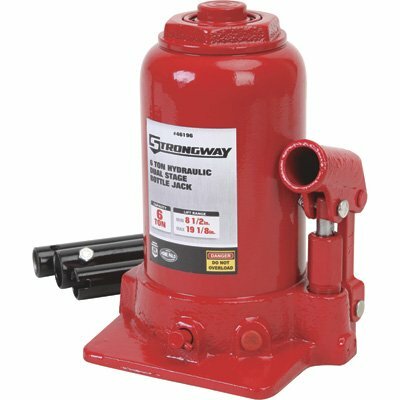 The Strongway Hydraulic Bottle Jack is constructed of high-grade steel, which provides extreme durability and reliability in a variety of different situations. Along with this, that jack is coated with a lead-free paint that is applied after a chemical wash to ensure a beautiful long-lasting paint finish that looks amazing. The process also makes cleaning the jack easier, because the paint finish is designed to resist oils, grease, and other dirt build up. The jack utilizes a high quality, large diameter hydraulic steel cylinder, which requires less oil pressure to raise a load. This feature greatly helps to reduce wear and tear on the jack, which is only going to increase the lifespan of the product. The hydraulic pump is constructed of QT450 Nodular Iron, which is incredibly strong and provides greater durability. It really does not matter if you are lifting a car, truck, or farm equipment you are going to need a jack that can accomplish the job while providing durability and reliability. The Strongway Hydraulic Bottle Jack can do just that, plus so much more. There are many excellent jacks on the market, but few can compare to the Powerbuilt 640912 All-In-One 3 Ton Bottle Jack. 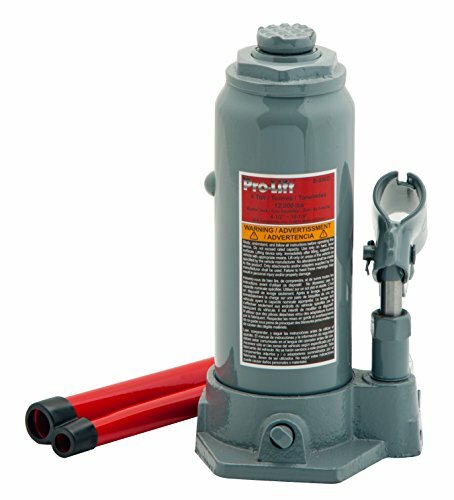 This hydraulic jack is one of the most reliable products on the market and it is suitable for a wide variety of situations. 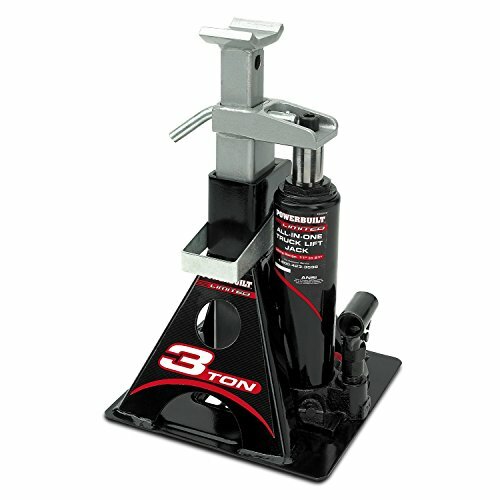 The patented design is unique and it combined a jack stand and bottle jack in a single, compact unit. What sets this jack apart from its competitors? You’ll find out below. How high do you need to lift the vehicle off of the ground? Regardless of your individualistic preferences, you can guarantee that the Powerbuilt 3-ton Jack will be able to deliver. This is the case because it offers an extensive height range of 11 inches to 21 inches. The jack can lift items a greater distance off of the ground than its competitors. This also makes it good for vehicles, construction jobs, and even framing. Also, it is vital to ensure your jack will be able to handle the weight safely. This is one of the areas where the Powerbuilt 640912 Jack truly outshines its competitors. This jack is equipped with a wide steel base, which helps to support the weight of the load. Thanks to the addition of the base, you can guarantee that this jack will support the weight, without any problems. Truly, it is hard to go wrong with the Powerbuilt 640912 All-in-One 3-Ton Jack. It is very unique and combines a jack and jack stand in a single unit. For the price, this jack is most definitely a wise purchase. If you want one of the safest jacks on the planet, this one should not be ignored! 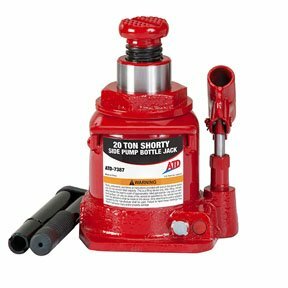 The ATD Tools 7387 Bottle Jack is one of the most versatile jacks on the market. It is very lightweight and comes with a convenient carrying handle. While the jack might be compact, it is still very impressive. In total, it has a maximum weight capacity of 20 tons. It has an operating force of 101 pounds, so you can guarantee that it’ll be able to lift the weight, without any problem whatsoever. Additional details will be provided below. Lift range: 6-1/2" - 11-1/4"
Rated for vertical use ±5?. You’ll definitely want to ensure your jack is going to last for many years to come. The ATD Tools Jack will be able to do just that. It is very durable and is protected by a 90-day warranty. You can guarantee that the jack will continue functioning as intended well beyond that time frame. Another good thing about the ATD Tools Jack is the fact that it comes with a multiple piece handle. This will allow you to adjust the size of the handle to meet your specific needs at any given time. There are 3 pieces in total, so you can extend the length of the handle as needed. This will also help to ensure that you’re able to lift the vehicle from a safe distance away. All in all, the ATD Tool 7387 Short Bottle Jack is definitely a good investment. It is lightweight, powerful and more than capable of supporting lifting the weight. The jack is also equipped with a convenient carrying handle. This combination makes it a good additional to almost anyone’s arsenal. If you’re looking for an outstanding bottle jack that will not break the bank, you should definitely spend a few minutes examining the Pro-Lift B-006D Jack. This specific jack is very sleek and it will be certain to withstand the test of time. While this jack is affordable, it is still very tough. It is capable of supporting a maximum of 6-tons of weight. Plus, it should be known that this jack is compact, lightweight and easily portable. Additional details about this specific product will be provided below. Are you interested in moving your jack from one location to the next on a regular basis? If so, you should definitely invest in the Pro-Lift B-006D Jack. This specific jack weighs just a little over 12 pounds. This makes it much lighter in weight than many of its competitors. At the same time, this jack measures in at 8-1/2 by 16-1/4 inches. This combination makes the jack easily portable. While it does not have a carry handle, it is still easy to move from place to place. It is downright pertinent to invest in a jack that is going to be able to hold the weight safely. This is where the Pro-Lift B-006D Jack excels. This specific jack is steel lifting saddle engineered. This helps to ensure that the product will be able to hold the load safely and securely. As long as the jack is strategically placed, the load will not wobble. At the end of the day, the Pro-Lift B-006D Jack is definitely impressive. It is lightweight, compact and easy to use. Plus, it meets all ANSI and PALD standards! All homeowners need a good jack. Of course, this is not a decision that should be rushed. Take your time, evaluate your options and make sure you get the best jack humanely possible! Put in your time and effort to ensure you’re totally satisfied at the end of the day.